Long ago I gave up the sedentary way of life, which had my working from on office. My work and writing can be done ANYWHERE! So why not go everywhere? I now spend a good deal of my time these days writing, finishing up books related to my work and adventures, and now I’m inviting you to join me. Got a book you’re writing (or have always wanted to write), a blog you’d like to catch up on or other creative project? I have beautiful locations around the world where I go to write, and I love having the company of people who “get me,” are also passionate about living true to their hearts and telling their story. Some of my favorite locations are Lake Tahoe in the summer, Thailand in the non-peak season (March through November), South America during their spring through fall (October to March), East Africa virtually anytime, the list goes on. And I’m always looking for new places. As you may have gathered from elsewhere on this web site, VisionForce is a gifting tribe. That means we function through mutual generosity. What I have an abundance of right now is free time (I work quite a bit, but I’m free to choose when, where and how much I work), my passion to share my work (workshops, retreats, etc.) and a global tribe of inspired visionaries. I invite you to receive my invitation to come and receive the gift my work. What I’d be joyous to receive is: accommodations for writing and holding retreats, and funding for travel and costs of living. 1 – You come and join me (and possibly others), wherever I am in the world. We each bring our wisdom of the creative process, and our desire to share what we’ve learned with each other. We share parts of the day together such as mornings, meals, hikes, discussion time and quiet time for writing, etc. It’s that simple. It’s not a grand production, it doesn’t take a lot of set up or planning. I will make special arrangements for the time to be inspired and beautiful. But mostly we’re just sharing life, working in an inspired setting with fellow inspired souls. With this option, you’d cover your own travel and accommodations costs (and I can likely help you save a buck on those! ), and I’d ask you make a donation of your choosing to support my journey and/or the VisionForce work. 2 – You provide a beautiful space and welcome me (and possibly others) to stay and work from, plus my travel costs (possibly covered by a collection from the group). I bring come with the intention to share my writing rituals, my work and my community with you and your people. Please Note: My preference is to keep this “in the tribe” so to speak, meaning that you are someone who is actively engaging with the VisionForce work and/or are a volunteer or patron, etc. This gives us shared context and a foundation from which to build. If you’re “part of the tribe,” which is an open invitation btw, then we’re already connected and you know how to reach me. Hope to see you someplace awesome! 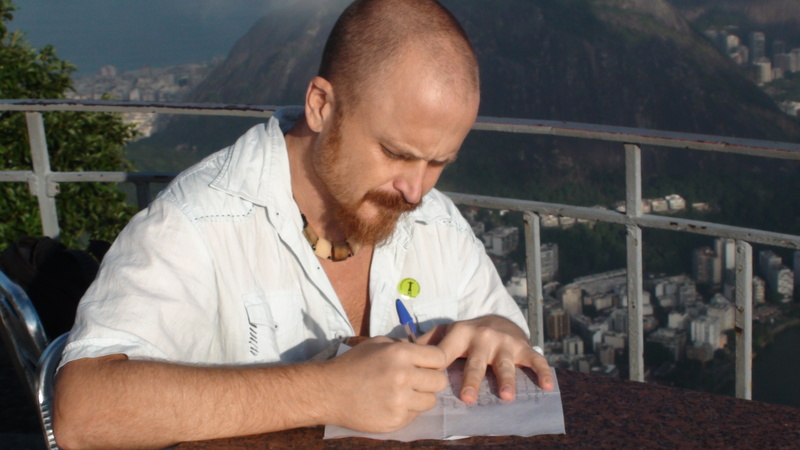 Below’s a photo someone snapped of me in a moment of passion, writing at the top of Mount Corcavado in Rio de Janeiro. How can you not be inspired on top of the world?